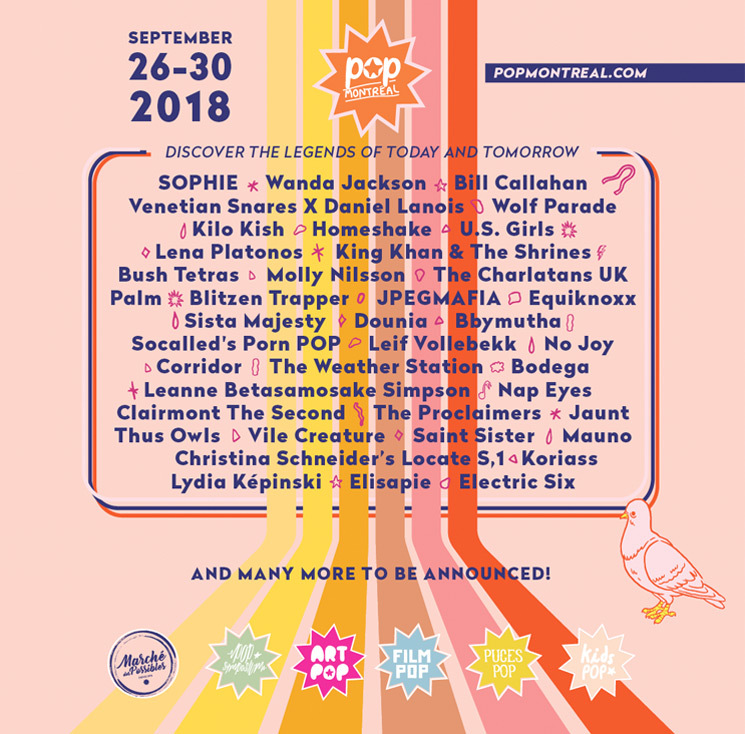 POP Montreal is returning for yet another year in the city, and organizers have just announced their initial 2018 lineup. The festival will take place in Montreal from September 26 to 30 this year. During that time, festivalgoers will be treated to the likes of SOPHIE, Wanda Jackson, Bill Callahan (f.k.a. Smog), Venetian Snares X Daniel Lanois, Wolf Parade, Kilo Kish, Homeshake and U.S. Girls. On top of that, other acts featured in the initial lineup include King Khan & the Shrines, Blitzen Trapper, Equiknoxx, Leif Vollebekk, No Joy, the Weather Station, Nap Eyes, Clairmont The Second, the Proclaimers, Mauno, Thus Owls and more. As usual, POP Montreal comes with several different segments, such as Film POP, Art POP, POP Symposium, Puces POP and Kids POP. And keep in mind that this is the initial lineup, with many more musical acts set to be announced in the lead-up to the festival. For a limited time, the POP Montreal Discovery Pass will cost you $100 plus tax (regular $300 plus). This pass includes skip-the-line access to the whole festival, among other perks. You can learn more about the various ticketing options over here. For full festival information and updates, keep an eye on the official POP Montreal website. Check out a trailer for the 2018 edition of the festival below.